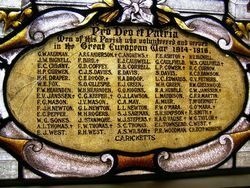 A stained glass window commemorates those from the parish who served in World War One. 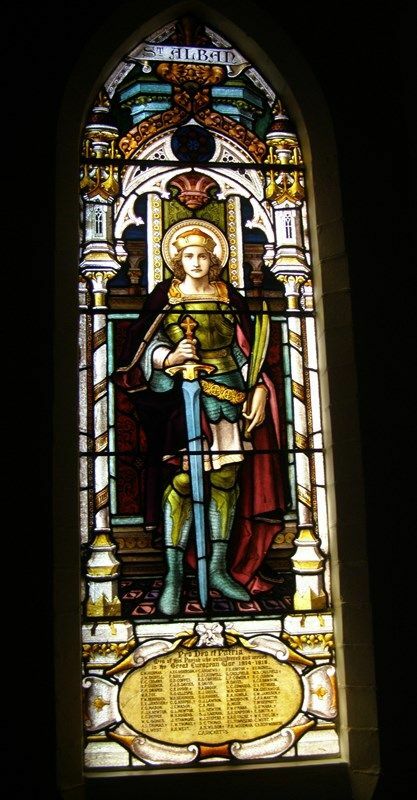 On Sunday last, at St. Augustine's Church, in the presence of a crowded congregation, the Vicar of the parish unveiled a beautiful stained-glass window, erected as a Roll of Honour, to commemorate the devotion to King and country of those who had volunteered for service in the great European War 1914. Psalms and hymms appropriate to the occasion were used, and the solo, "The Lord is Mindful of His Own," was sympathetically sung by Miss G. MacDowell. The sermon was preached by the Rev W. R. Cooling, who paid a tribute to the heroism and devotion of our soldiers, with special mention of those who had laid down their lives in the great campaign for righteousness and liberty. He made a stirring apppeal for reinforcements for our men at the front. There were two planes of life recognised in the Scriptures. The higher, in which men answer to the call of righteousness and duty because of the spirit which is in them: the lower, in which men, because they lack the true spirit and refuse the call of duty, must suffer compulsion from without. It is much to be desired that all men should act honestly because of an honest heart and spirit impelling them from within, but in as much ; as some have not this spirit, commands such as "Thou shalt not steal " must be imposed by compulsion from without for the welfare of the whole. "The law," says St. Paul, "was not made for the righteous man, but for the lawless and the disobedient etc." The service was a very impressive one, the expression of many being " I would not have missed it for anything." The window, which is a beautiful work of art, has as its central figure St. Albans, the first British martyr. It was designed by the well known artist, Mr. Geo. H. Dancey, and splendidly executed by Messrs. Brooks, Robinson & Co.
Seaside News (Cheltenham, VIC), 22 December 1917.